John Jay College has been recognized again for contributing to students’ economic mobility into the middle class and beyond. A new report from The Equality of Opportunity Project lists John Jay in the top 10 nationally in intergenerational mobility of students. The report shows that of the 54% of John Jay students who come from lower-income families, 61.1% later rise to the top 40% in higher income. 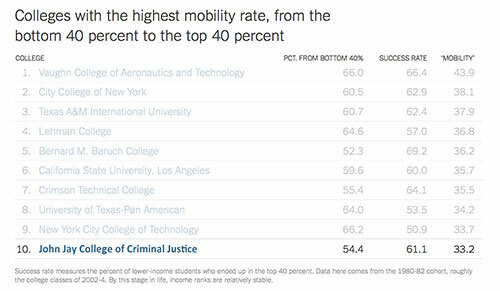 According to the New York Times, the mobility rate developed by the researchers “captures the share of all students at a given college who both came from a lower-income family and ended up in a higher-income family. The top of this list is dominated not by elite colleges, but by mid-tier public ones, including the colleges that make up the City University of New York.” The comprehensive study looked at anonymous tax filings and financial aid records of millions of college graduates. The study on mobility is titled “Mobility Report Cards: The Role of Colleges in Intergenerational Mobility” and available here.